Yesterday I had a wonderful day visiting with my friend and colleague Isabelle Zolkower, who also has the fortune of being married to a photographer. Rick, her husband, took the photos of me on Facebook and on this site – and I couldn’t be happier with them! My son told me that he now knows where he gets all of his good looks from!! I think he’s fishing for something? After the morning primping in front of the camera, Isabelle took me to a restaurant near her home called “live” which serves organic raw food (and some cooked food too). I’m hoping to share the wonderful experience with you through words and images. Be gentle with me, I’m not used to taking photos yet and they really need some practice! 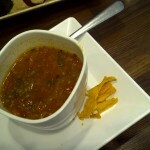 Lunch started with Tomato and Quinoa soup (I started the soup before I remembered to take a photo – my apologies). It was served with dehydrated sweet potato chips sprinkled with cayenne pepper. The chips were a special treat and now I can’t wait to get my own dehydrator to make my own. 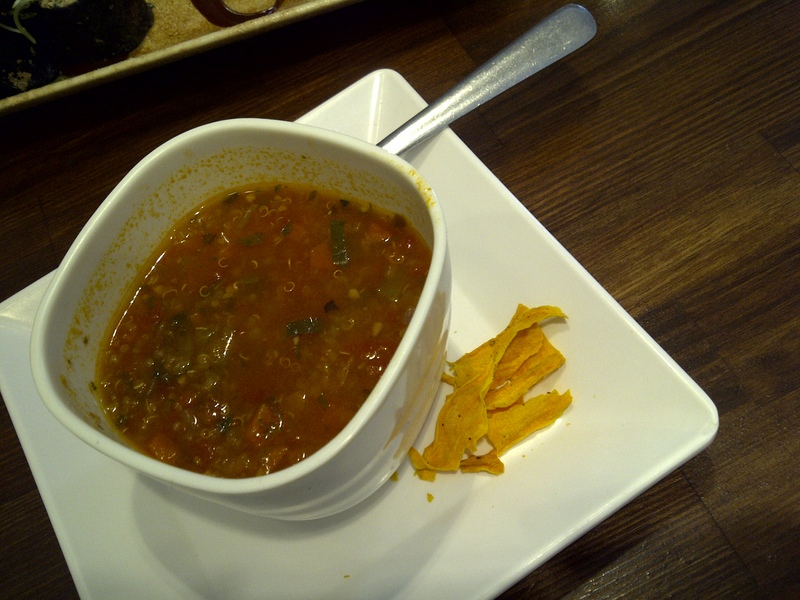 The main ingredients of the soup were tomato, quinoa, carrots, onion, fresh basil and oregano from my best guess. Then, between the 2 of us we chose 3 entrees – can you say greedy??? 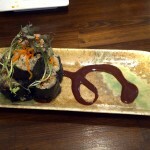 The first to arrive was a Pecan sushi – can you imagine? 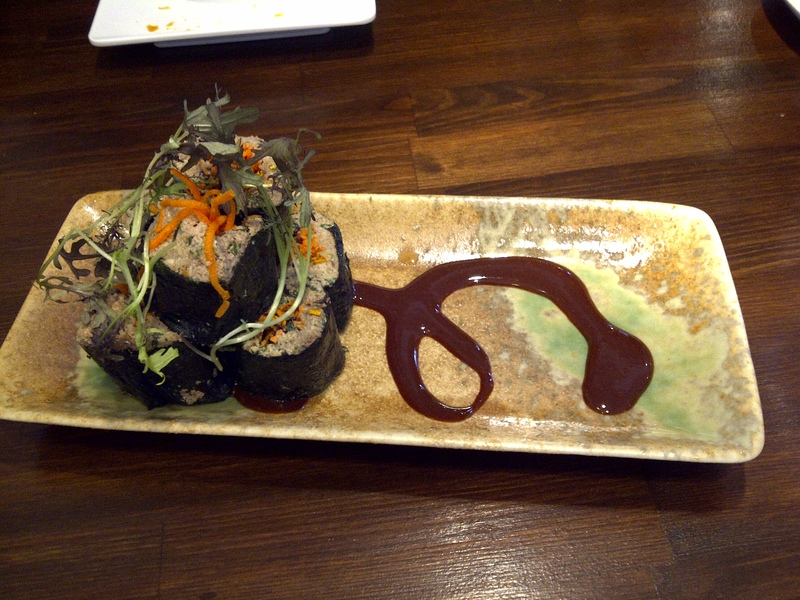 Wrapped in nori seaweed was pecan sunflower hummus with herbs around slivered carrots and dehydrated sweet potatoes, with a miso maple glaze. It was so good. 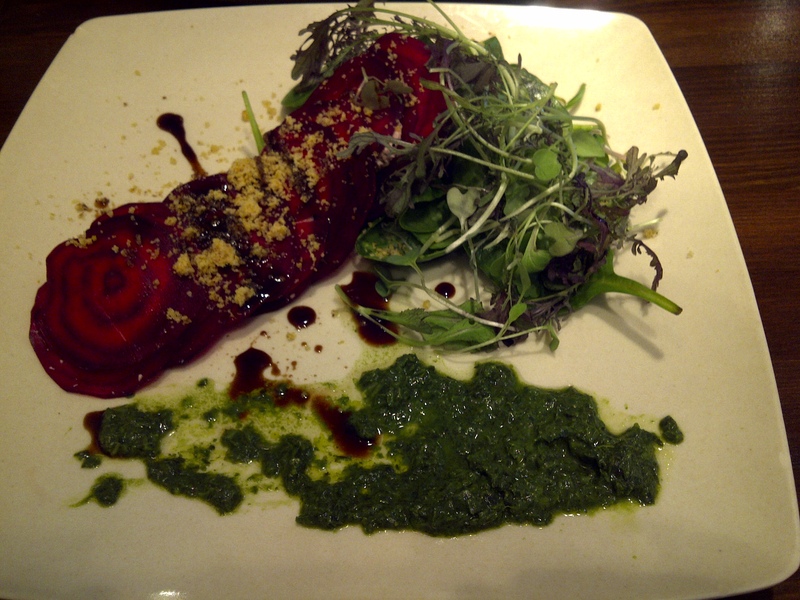 A beet ravioli with basil pesto and balsamic reduction arrived next. The ravioli was made from very thinly sliced beets separated by an herbed cashew spread, and then on the top was sprinkled ground cashews. This was served with a spinach salad with a lime dressing and the balsamic reduction. I want to try to recreate this myself – perhaps at Carolyn Dupont’s next retreat in June! 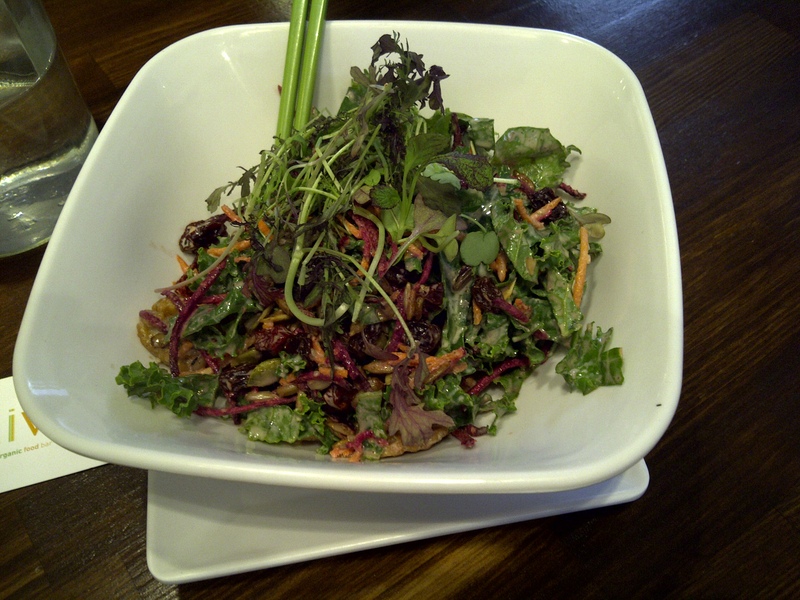 The final entree was Rainbow kale and walnut salad – kale, walnuts, carrots, beets, raisins, seeds, sprouts, sun dried tomatoes dressed with a creamy dill tahini sauce. This was tasty, but I think I would leave the sun-dried tomatoes out, and use walnut butter instead of the tahini to make the dressing. Neither of us loved the desserts, so we won’t say more about those. But overall we had a wonderful lunch. I hope these descriptions and photos give you food for thought for your next raw food experiments! 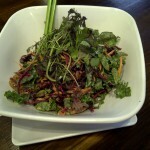 Today I found a wonderful voice on the web – the Raw Foods Witch. 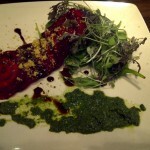 Her site is fun, informative and really does take the scary out of raw food. Further, she has taken her passion for food and made a fabulous, interactive, versatile site for everyone to use. You can input your recipes and it will “magically” make a grocery list for you. Even more, she has some great posts that really bring the whole in holistic to mind. When you get a chance, go visit her site, and stop by this great post: http://rawfoodswitch.com/alternative-health/breast-cancer-emotional-reactions-glimmer-hope/. Make sure that you sign up for her Cues – you’ll find yourself waiting for Wednesdays!Way to go Nathalie – great job! Thanks for providing valuable information without being militant about it.